Last month, I shared a status on Facebook that mentioned that I had received a couple of negative comments about how much I talk about my mom. I received tons and tons of support for showing my mom love, and then one friend even suggested that I share something I love about my mom daily. Well, I’ve never been one to turn down a “dare” so I took the challenge. And now that it’s September (the challenge is over! ), here’s a run down of just a few of the endless reasons I love my mom. Day 1: I love my mom because she gave me her heavy duty umbrella this morning and took my flimsy little umbrella. And it came in handy when I drove up to daycare and the sky was falling. My little umbrella is for sprinkle storms, lol. Thanks again ma! Day 2: I love my mom because she helps me start my day on a positive note every morning. During my commute, I always talk to her about how we’re feeling, any new family updates, and current events. It kinda reminds me of when I was a kid and she would call me at home after I got off the bus. Back then, I thought she was magic because she could tell if something was wrong just by the way I said hello. I enjoy having someone to check in with. Day 3: I love my mom because she has believed in me when I didn’t believe in myself. She reminds me of who I am when I’ve forgotten. Day 4: I love my mom because she knew I needed a break even though I’d never ask. She came here, got Frederick, and then brought him back because she doesn’t want me on the road. Thanks again. Day 5: I love my because she exposed me to culture and education outside of the classroom. I love to travel, and I know it’s partly because it’s second nature. Day 6: J’adore ma maman because she always includes me in her If-I-win-the-big-lottery-wishlist. Day 7: I love my mom because she has become the caretaker for my aunt, even though she had a million reasons not to. She’s my example of duty, love, and family responsibility. And yes, I know I skipped yesterday–I wanted to be consistent with the calendar so that I don’t have to keep looking to see what day I’m on, lol. Day 8: I love my mom because when I was a kid, she never gave me a hard time for my preference to write her a letter when something was bothering me over talking to her. I still remember vividly putting letters on her pillow and running to my room and pretending to be sleep when I heard her walking to the back. It means a lot to me to have had someone who respects my ways of communicating. Day 10: I love my mom because she instilled the importance of community service in me. She took us to feed the homeless on holidays, she encouraged me to tutor my peers and students in lower grades, and she never let me forget to give back to the community that supported me. Day 12: I love my mom because I get my niceness under pressure from her. I’ll credit my fiestiness when I’m fed up to my daddy or maybe my aunt Vernita, but I know I get my (albeit reluctant) need to try to keep my temper at bay and smooth it out if at all possible from her. She hates conflict and avoids it like the plague. Day 13: I love my mom because she and Frederick have a secret language. When we skyped her yesterday, he started grinning and “talking” to her. I have no idea what their convo was about, but they enjoyed it. Day 14: I love my mom because when she wanted me to divert my focus to positive things, she didn’t just say “be positive,” she gave me plenty to focus on. She’s been in my corner, she helps me physically, emotionally, and financially, and when I’m feeling like I’m missing out, I can redirect to how much help I have from her. Day 15: I love my mom because her food is yummy. She says when she cooks for me, she cooks with love for me and my baby, and that’s why I haven’t been able to replicate a couple of her (seemingly very simple) recipes. Day 16: I love my mom because she’s always been a real person, not a fantasy. When I go through various life experiences, she doesn’t judge me, but she shares with me similar experiences she’s been through. She’s never pretended to be perfect, and I appreciate that because she’s a true example of “how I got over”. Day 17: I love my mom because she tells me stories about my relatives who have gone on. She lets me know that they were my guardian angels on earth too. And I wouldn’t really know that I am anything like my Aunt Vernita if my mom didn’t tell me. Happy birthday, Vernita. Day 18: I love my mom because she raised me in church, and I still have a family at Zion Travelers to whom she gives regular updates (and they actually care!). I love my mom because she has Frederick in church when he’s in MS.
Day 19: I love my mom because she plays Wordfeud with me and gives me commentary on her other games and background life info about the randoms she plays lol! Day #21: I love my mom because she really took care of my hair and skin when I was growing up. She never let me sleep with stress on my hair, which meant she combed and brushed my hair every single morning. And she lathered me up with cocoa butter, aloe vera, and whatever else to make sure I didn’t have scars and such. I finally appreciate this now that Frederick is starting to come home with various scars. I also love her because she STILL takes care of my hair when she can. She will sit down and twist all this hair I have if I ask. Day #22: I love my mom because she encouraged me to start taking advantage of kids eating free at Piccadilly so on nights like tonight when I don’t feel like cooking, I can still make sure Frederick gets his veggies. Yum. Reminds me of going to Morrison’s after church some Sundays! Day #23: I love my mom because she has always given me space to choose my path. When faced with a fork in the road, sometimes she won’t even give me her opinion if she thinks I will just go with that instead of figuring out what I want. Case in point: when Tougaloo sent me a letter before I went back to school for 11th grade saying if I maintained my GPA I could bypass my senior year and go there on a full ride, she let me choose without pushing me in any direction. She said she didn’t want me to ever look back on life and regret a decision because I didn’t make it. I’m the master of my fate. Day #24: I love my mom because she sticks up for me. Sometimes I get bogged down in wishing someone would speak up for me/defend me/have my back in tough situations, not knowing that my mom already has. She just may not tell me for months or years, lol. Day #25: I love my mom because I can’t for the life of me figure out how she did laundry and ironed clothes for our family when I was growing up. It’s only two of us now, and I never feel like I’m caught up on laundry, and I definitely don’t have time to be ironing LOADS of clothes at a time. Seems like her days were made up of >24 hours, but of course they weren’t. Guess she hides the superwoman get up under her clothes, lol! Day #27: I love my mom because even though math is my forte, I have effective writing skills because of her. She is a retired English instructor, which means when I was growing up I couldn’t finish a sentence using incorrect grammar without her interrupting me and making me correct myself. I was constantly looking in the dictionary for the correct spelling of words because she wouldn’t just tell me. I never received the kind of help i wanted when writing papers because she believed the only way to learn was to completely write the paper before she marked it up with red ink. All of that has resulted in writing skills that people seem to enjoy reading (www.nadajo.com) and that I am able to use in proofreading. Thanks, smarty pants lady. 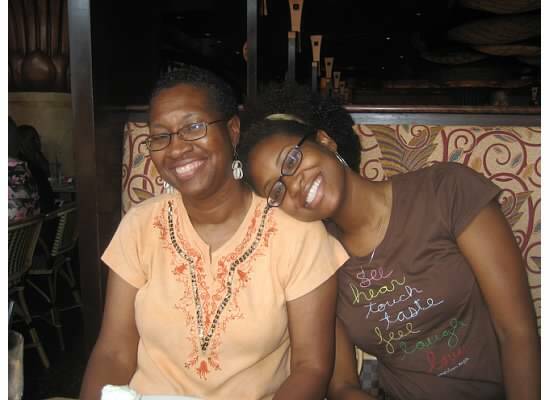 Day #28: I love my mom because she is one of the main reasons I wanted to attend an HBCU. She took me to probably every JSU home game and several of the away games if there was bus headed there, and she made sure I was on somebody’s campus every summer. Day #29: I love my mom because she prepared me for my future. I wasn’t afraid to stay on campus (even at 16!) and I wasn’t afraid to move to another city after college because neither was new frontier. She let me try different things and figure out things while I was growing up so that she could catch me if I fell. I still remember her telling my dad that they needed to let me go out on dates while I was still at home so that I wouldn’t get to college and lose my mind. I can still see the frown etched in his face when my first date got to the house to introduce himself a couple of days before the actual date (for which my dad didn’t even answer the door–he went and sat on the porch. LOL!). Day #31: I love my mom simply because she’s my mom and she’s stuck with me for life. LOL! Thanks for bearing with me all month! Bye August! Ranada, it was beautiful to read each day or every other day how much of an effect your mother was on your life. It is kinda bothersome that people were negative about hearing the love of a mother. I’m glad you took those negative comments to create something more positive than ever. I’m not mad at this list at all. Celebrate your mother while she’s here.